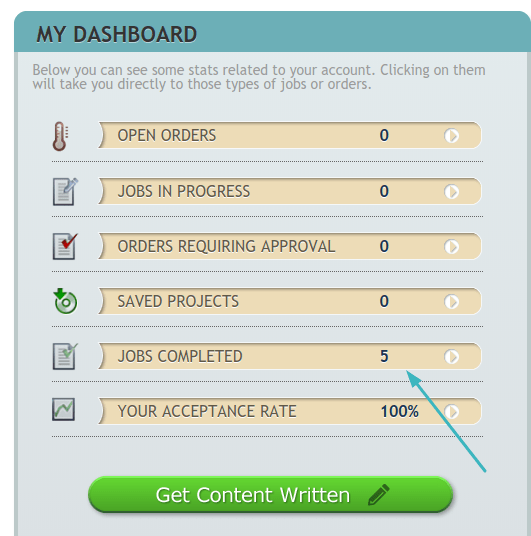 Hirewriters Review – Legit Content Mill, Or Scam? My review today comes from personal experience, I’ve recently been using Hirewriters.com to outsource some content writing for my website and I’d like to share that experience with you today. As well as being a platform where you can purchase content, you can also become a writer on the platform. I haven’t checked out what it’s like to write here, it’s something I also intend to try out; so this is mainly going to be from the perspective of purchasing content today. There are many reasons why you may want to purchase content for your blog or website. In my case, it’s been the school six week break and my time has been more limited. But you also may just want to produce more content than you have time to write. Some people entirely outsource the writing for their website and do not write for it at all. Whatever reason you may have, having a go-to place, or person, that can write for you when you need it – is very useful! Service: get content written/freelancing opportunity. Cost: free to join, content prices vary. Overall rating: from the perspective of purchasing content, I’ve had both average and excellent content written so far and this has completely depended on how much I was willing to spend. When I opted for skilled writers, the quality was excellent. When I paid less, I had to make some changes; but it was still much better quality wise than something like iwriter, which I have also used on occasion. You are meant to be a native English speaker to work for Hirewriters, which isn’t the case with many content mills. Although, when I got cheaper writing, I my suspicion was that they were not native English speakers!! So, I am unsure about whether you need to provide any evidence of this. Hirewriters is an online content mill where you can purchase, or write content as a freelancer. You can purchase affordable content for your blog or website – if you are happy with the writing, you can accept it. If you’re not, you are also able to reject it. Appearances can be deceiving though! Because when I first arrived on the site, I felt it looked a little outdated and wasn’t that confident that I’d get decent content written. So, I was pleasantly surprised when I received a quality article the first time I purchased one. You’re able to outline instructions to your writers – such as article length, tone and keywords. You also request how quickly you need the content – in as quick as six hours, (at extra cost!). However, don’t choose or hire the writer directly, (unless you already have writers you have favourited). You submit your request to Hirewriters and it will be added to the pool of jobs available; writers can then choose to take the job and must complete it in the time you have allotted. Once you have jobs completed, you are able to favourite the writers who wrote the content and send them requests directly in future. This is really helpful, when you come across talented writers. How Do You Get Started At Hirewriters? The site is simple to use and you can get content written very quickly. You are able to sign up as either a client, (to purchase content) or as a writer. As I initially signed up to purchase content, that’s what I will run through right now. As you can see above, you will simply need your name, email address, username and password to sign up. Once you have signed in, you can get your content ordered as soon as you add money to your account. If you look at the right handside of your dashboard, you will be able to check your balance and add money to your account. You can add funds via PayPal, by credit or debit card; or even via other things like crypto currency! You need to add at least $10 into your account initially. With your first deposit, you can make a 25% bonus – so, the more you deposit initially, the bigger your bonus. I have only had content written so far. But there are other options available. Article length – word count of: 150-300, 301-500, 501-700, 701-1000, 1001-2000, 2001-3000 Personally I tend to opt for either 701-1000, or 1001-2000. For a shorter length, I may just add extra words myself. As I like my articles to be at least 1500 words for the most part. Language – either English-American, or English-British. Writers time limit, (between 6 hours, (extra charges), 12 hours and 10 days). Writers skill level: Beginner, general, skilled, expert. Article tone, (e.g. funny, professional). Remember to change this one, otherwise it will automatically save as professional, which is what I have done before! Special instructions. Here you can give in depth instructions about how you want your article to be written. It’s a good idea to give detailed instructions here. The more detailed you are, the better the result is likely to be. I have also often had writers contact me for additional information and they have been quite thorough in trying to do the job correctly. As you fill in the form, you will see the minimum price for your article. This will change depending on what your word count request is and the skill level of the writer. I had the best content written when I opted for a skilled writer, but the content was a lot more expensive. When I have gone for general skill, I found I had to make changes to the content and improve it. However, that’s just my experience so far. Once you have submitted your order, that’s all that needs to be done! you will be emailed when your article is ready to approve. As you can see by the image, I’ve currently had 5 articles written and I have accepted them all so far – so I have 100% acceptance rate. You don’t have to accept an article if you don’t think it’s up to standard. You can either request a revision, or simply fire the writer. However, you can see that your acceptance percentage rate will decrease if you reject aritlces. This means that some writers may be less likely to take your job. This will particularly be the case with good writers who have a high rating to uphold. If you like the writer, you can favourite them and you’re also able to tip them. I did tip a writer for the first job I recieved, as I felt the standard was very high and I was impressed with the work. You can search for writers directly. This could be useful because, you can search for writers that are already knowledgable within your particular niche. I personally haven’t used this feature yet, but am thinking this would help ensure I get suitable writers for the job. Sometimes, writers will take a job even if they don’t have any knowledge at all about the topic in question and obviously, you’re going to get an inferior post as a result, (unless they really research the post first, which I dout will happen for a low price). How To Be A Writer On Hirewriters & How Much Can You Earn? Some people opt to do some freelance writing while they grow their blog or website. Because, you can go without earning anything, or a very small amount, for a long while! Generally, I wouldn’t recommend writing for a content mill, because the pay can be so low, (especially starting out). However, if you’re living in a country where the US dollar goes a lot further, then you could get-by on a smaller income and some people find working for content mills convenient. But I can also see the appeal of content mills. Because some new writers may not feel confident enough to bid for jobs on their own yet. For example; by joining an online market place or somewhere where you’d have to be hired directly. By joining a content mill, you can test the waters a little and see if it’s something you may want to do. To sign up here, Hirewriters are only looking for native English speakers. You will need to complete a small grammar test online and if you pass the test, you’ll be able to get started. How much you earn is going to depend on both your skill level, your ability as a writer and how fast you can produce content! The more you do this, the more efficient you will come over time. Some people could knock out 1000 word articles in half an hour. I’m not one of them… But I wish I could produce decent content that fast! Personally, I see it as unrealistic that you would write 20 x 300-500 word articles per day. But let’s just say you decided you could write 6 x 500 word articles a day as a beginner writer. $2.25 x 6 = $13.50 Or as an expert writer, 6 x 10.66 = $63.96. So, until you get to the expert level, it seems unlikely you’re going to make anything more than a very small supplementary income at best. To get to the expert level, you need to have completed 12 jobs with an average of 4.6 rating. However, if you’re completing several articles a day; you will be able to reach this level very quickly if you’re a good writer. I also wonder how many people actually opt for the expert writer level though! Seeing as I myself have never opted for that and the fact that some expert writers will take a far lower paid job. What is your experience writing for hirewriters? Let me know in the comments. How Much Do Articles Cost To Purchase? How much articles cost vary depending on the word count and what level of a writer has been requested. However, if you request a beginner level article; you may still have a skilled level writer pick up the job. I have tended to opt for general or skilled articles so far and have found I’ve had better success opting for skilled writers, but that it’s been quite a lot more expensive. I feel it’s certainly been worth the additional amount, but sometimes I haven’t minded opting for a cheaper article and then slightly editing it, or adding additional content to increase the word count before publishing. Highest quality writers that I’ve found from a content mill. Simple to outsource articles, no hassle. You can purchase content, as well as write yourself. You don’t have to accept the content if it’s not good enough. You can favourite writers and hire them again. All writers are meant to be native speakers, (although, I have been unsure of this on occassion). If you opt for general or beginner level writers, you will have a higher chance of receiving low quality. You cannot join as a freelance writer, without being a native speaker. What do other people say about Hirewriters? Most of the feedback I can see online, seems to be from a freelancer perspective. Unfortunately, I do see that there are many writers that feel upset with how they have been treated. This seems to be pretty normal for content mills. 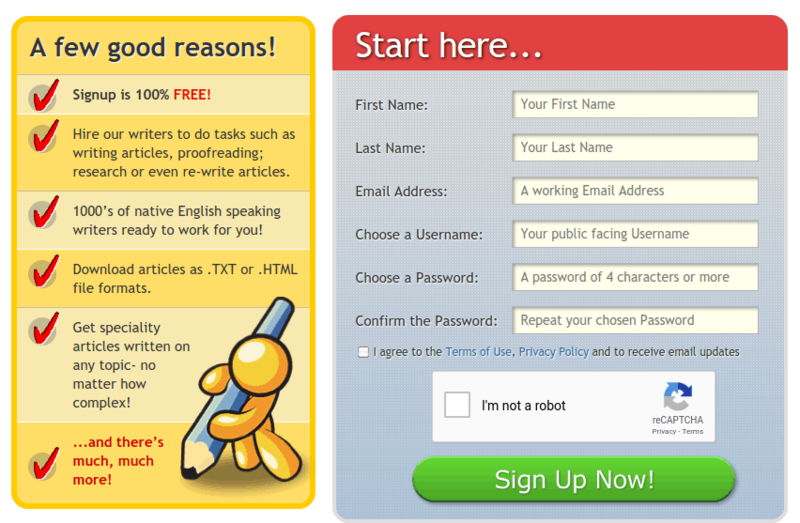 With sites like iWriter, or blogmutt– many people also have complaints. Complaints seem to revolve around being banned for no reason, or having money withheld. That being said, there are plenty of other writers that do seem happy with the service and have written for this company for many years. Want to share your experience? Please comment below. As I’ve mentioned, the articles I’ve recieved have ranged from average to excellent so far. Although, the lower quality ones were recieved after only opting for general writers. If you want to ensure higher quality, I suggest you opt for skilled level, or expert writers. If you don’t mind doing some editing, then go for the cheaper option. Ultimately, even if you have to do a bit of editing – you can still take time. Getting content written here is a good option if you’re on a budget and trying out writers here is very affordable. Conclusion: Is Hirewriters A Scam, Or Legitmiate Content Mill? 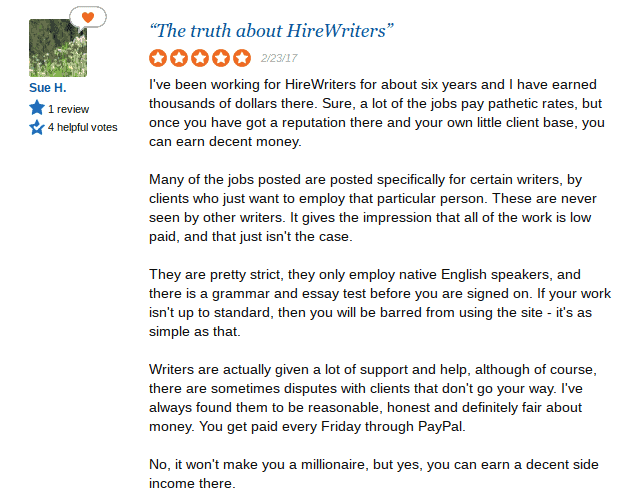 Hirewriters isn’t a scam – I’ve had some decent content written here, at affordable prices. If you’re looking for a way to grow your blog or website; or simply don’t have enough time to produce the amount of content that you want – then outsourcing the work is a good option. From a writers perspective, there are certainly mixed reviews – but ultimately, it’s free to sign up and try it and there is minimal risk involved in trying your hand at being a writer on this platform. The problem is, writing for content mills does not pay well! So, it’s not something I’d recommend as a long-term choice! If you want to make more for your writing in the long term, having your OWN blog or website is a good idea. Because then you can earn from your content in the long term via various means, such as sponsored posts, advertising and affiliate marketing. Having my own website has produced me the most income online so far; this is where I got started. 5 Content Mills Like Textboker. Hi , first thanks a lot for the article! This hirewriters review is pretty amazing, it seems this is a good place to start. I still have one question though, is there any copyrights involved in this case? Hey PJ – yes outsourcing content on fiverr is not the best platform. Although, fiverr does still have some good gigs. I’m not sure what you mean by copyrights. Basically they would check whether the article is original – although, I also double check this. I copy and paste the articles on to the WA site content platform – if you publish directly from there; they will scan the content before it’s publish to double check it is unique. So far, every article has come back as unique – which can’t be said for all content mills! I’m glad I read your post. I s always had a knack for writing and I’m going to give hire writers a shot, if nothing else for practice. I have been writing content for my websites and friends of mine that own small businesses for years. I don’t mind doing research to learn more about specific subjects that I’m not familiar with. I’ve done so much for free practicing, it would be nice to get paid. Thank you so much for the post, I’ll click your link and join in a minute. Hi Joe, yes it could be worth checking out as a stepping stone, to give you a bit more confidence regarding getting paid work perhaps? You could try and see how you go anyway. Good luck! What an interesting article. I had been thinking about applying to work as a writer but I can see from the figures you have put down that it would work out to be a lot of hard work for very little rewards. I can see that I would be much more worthwhile hiring a writer to work on a project and this is something I may consider in future, thanks to your useful information.